Lieutenant General Robert Joseph Friedman was Vice Commander of Air Force Logistics Command. The command ssion is to keep the Air Force's aerospace weapon systems ready for action efficiently and at the lowest possible cost to the taxpayer. 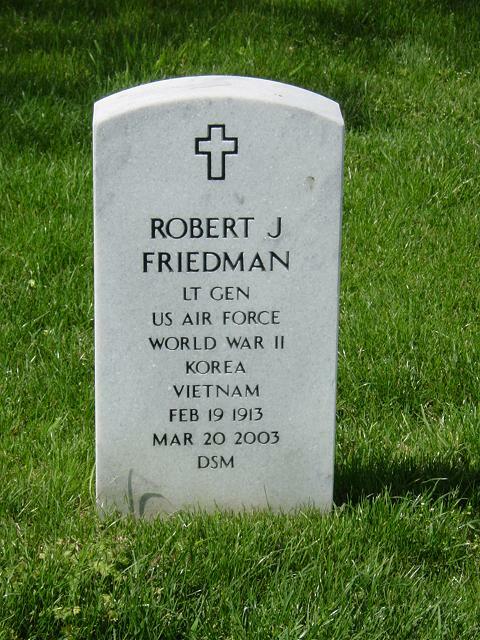 General Friedman was born at Bethpage, Long Island, New York, in 1913. He attended high school in New York and received his bachelor of science degree in aeronautical engineering from Alabama Polytechnic Institute (now Auburn University) in May 1936. Having previously accepted an appointment as second lieutenant, Field Artillery, in the Officers Reserve Corps in May 1935, he entered active military duty for three years. He first served with the 83rd Field Artillery at Fort Benning, Georgia, and then successively as company commander, district construction officer, and district transportation officer, Fort Douglas District, Civilian Conservation Corps. He left active military service temporarily in 1939 and was engaged for two years as liaison aeronautical engineer with a major aircraft company, directing shop engineering, design, and engineering changes. Immediately prior to World War II, he re-entered military service at Wright Field, Ohio, and served a four-year tour of duty in aircraft maintenance engineering at Headquarters Air Service Command. In February 1945 he went to England and served as air inspector and then deputy for materiel and maintenance with the 95th Bombardment Group and later as deputy chief of staff for materiel, Headquarters 3rd Air Division, at Thetford. During this time, he participated in the Rhineland and Central Europe campaigns. He returned to the United States in August 1945 and reported to Wright Field for another tour of duty in maintenance engineering. He was assigned to Headquarters U.S. Army Air Forces, Washington, D.C., in September 1946. General Friedman reported for duty with the Far East Air Forces in 1950. While assigned to General Weyland's operations staff in Tokyo, Japan, he earned the Legion of Merit for development of plans for the most effective employment of airpower against the enemy in the Korean War, and an oak leaf cluster thereto for development of a program for basing and housing all U.S. Air Force elements in the command. After graduation from the Air War College in June 1953, he assumed the position of assistant deputy chief of staff, comptroller, Headquarters Air Defense Command at Ent Air Force Base, Colorado. In September 1956 he returned to Headquarters U.S. Air Force for duty on the comptroller's staff as deputy director of budget and later became director of budget. For his exceptionally meritorious service in this capacity, he received the Distinguished Service Medal (Army Design). General Friedman was transferred to Air Force Systems Command at Andrews Air Force Base, Md., as deputy chief of staff, comptroller, in July 1961. His performance of outstanding service in this position led to awards of the second and third oak leaf clusters to the Legion of Merit. In January 1963 General Friedman returned to Headquarters U.S. Air Force, as director of programs, Deputy Chief of Staff for Plans and Programs (reorganized as Deputy Chief of Staff for Programs and Requirements). He became assistant deputy chief of staff, Programs and Requirements, in September 1964, and in February 1965 he assumed the position of deputy chief of staff, Programs and Resources. For his exceptionally meritorious service in this position, he received the Distinguished Service Medal (Air Force Design). General Friedman served as chief of staff, United Nations Command and chief of staff, U.S. Forces Korea from August 1967 until he came to Headquarters Air Force Logistics Command at Wright-Patterson Air Force Base, Ohio, in May 1969. His exceptionally meritorious service in Korea led to the award of the first oak leaf cluster to the Distinguished Service Medal (Air Force Design). He is a licensed civilian pilot and regularly flies his own aircraft. His military decorations include the Distinguished Service Medal (Air Force Design) with oak leaf cluster, Distinguished Service Medal (Army Design), Legion of Merit with three oak leaf clusters, Air Medal and the Air Force Commendation Medal. His foreign decorations include The Most Noble Order of the Crown of Thailand (First Class-Knight Grand Cross) and the Korea Order of National Security Merit Second Class. His hometown is Mulberry, Florida. 1. Aug 1935 - Aug 1935, Headquarters Battery, 13th Field Artillery, Fort Bragg, N.C.
2. July 1936 - July 1937, 83rd Field Artillery, Fort Benning, Ga., and Fort Bragg, N.C.
8. September 1946 - February 1948, Chief, Aircraft Section, Maintenance Branch, Air Supply and Service Division, Headquarters U.S. Army Air Forces, Washington, D.C.
9. February 1948 - January 1950, Staff officer, Materiel Program Planning Office, Deputy Chief of Staff, Operations, Headquarters U.S. Air Force, Washington, D.C.
10. January 1950 - August 1950, Chief, Program Group, Deputy Chief of Staff, Operations, Headquarters U.S. Air Force, Washington, D.C.
12. August 1952 - June 1953, Student, Air War College, Maxwell Air Force Base, Ala.
13. July 1953 - September 1956, Assistant deputy chief of staff, comptroller, Headquarters Air Defense Command, Ent Air Force Base, Colo.
14. September 1956 - July 1961, Deputy and later director of budget, Air Force Comptroller, Headquarters U.S. Air Force, Washington, D.C.
15. July 1961 - January 1963, Deputy chief of staff, comptroller, Air Force Systems Command, Andrews Air Force Base, Md. 16. January 1963 - September 1964, Director of aerospace programs, Deputy Chief of Staff, Programs and Requirements, Headquarters U.S. Air Force, Washington, D.C.
17. September 1964 - February 1965, Assistant deputy chief of staff, Programs and Requirements, Headquarters U.S. Air Force, Washington, D.C.
18. February 1965 - August 1967, Deputy chief of staff, Programs and Resources, Washington, D.C.